Higgins has a team of 250 staff on the ground, the majority of who are locals. Higgins Chief Executive Officer David Geor says that after seeing the destruction and the impact Cyclone Winston had on the Higgins staff and their families it implemented a response plan to help. “We want to ensure we are doing everything we can to support the Fijian people at this difficult time,” he says. The entire Higgins team in Fiji are now involved in the clean-up efforts to clear roads, reinstate the many bridge approaches swept away and to restore amenities.“The Western Division, and particularly the northern area, was amongst the worst areas hit and many of our employees’ families lost their homes.” Higgins is providing support to these families, and other residents, in the form of food, water and clothing to meet their immediate needs with supplies trucked in daily from Nadi. “The F$250,000 of support will be delivered on the ground by this dedicated team of Higgins staff who are now in Fiji assessing how best to allocate the funds across the Western Division. “To ensure we can make the biggest difference possible, we have our people identifying and distributing aid where needed.” This support will be invaluable to those impacted by Cyclone Winston, says Ray Edwards who is heading the Higgins team responsible for the delivery of the aid in Fiji. 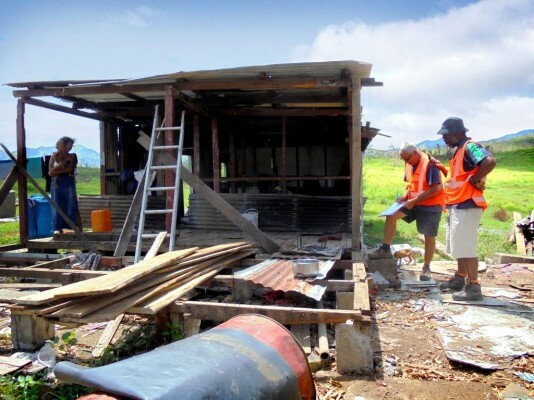 “We are here on the ground and have seen first-hand the areas where assistance is desperately needed.” Edwards says that while the resorts around Nadi and the islands are up and running there is widespread destruction in many areas. Since 2013 Higgins has invested more than NZ$10m in Fiji in the form of the property, machinery and resources. It is currently contracted by the Fiji Roads Authority to maintain the roads in the Western Division on the island of Viti Levu. It is also the contractor for the Nadi N2, a new four lane road from Nadi airport to Denerau Island, which is a key tourist destination within Fiji. Since beginning the Fiji road maintenance contract in 2013 Higgins has implemented a number of initiatives including donating computers to schools, providing community rubbish bins, sponsorship of sporting events and a significant financial contribution to a Nadi orphanage. In 2015 Higgins built a new state of the art asphalt plant in Nadi. Higgins Fiji sources much of its raw materials from local suppliers and is committed to working alongside these Fijian businesses to achieve the best results for the local people.